20 August. Speaking in Parliament in response to Thai Regent Pridi Phanomyong’s disavowal four days earlier of his country’s war declaration, Foreign Secretary Ernest Bevin declares that Britain, which has considered itself at war with Thailand, would base its treatment of the country on Thai willingness to make restitution for Allied losses and contribute to the economic rehabilitation of the region. 22 August. The Office of the Prime Minister issues a communique stating that the Thai government is willing to submit the question of the Thai–Indochina boundary to the United Nations for resolution, and that it will abide by the UN’s decision. 27 August. Reacting to local takeovers by French or nationalist forces, the viceroy and head of the Laotian government, Prince Phetsarath, takes control of the country’s administrative capital, Vientiane. The Japanese troops previously running the city are repatriated across the Mekong into Thailand to begin their long journey home via Bangkok. 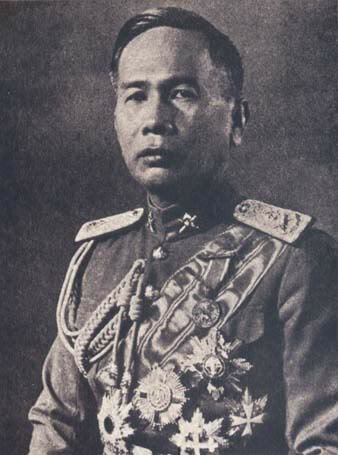 Phetsarath immediately authorizes creation of a Lao Issara Army out of the forces Japan had organized into a civic guard. Next day, he notifies all provincial governors that Lao independence remains an immediate goal and warns them to resist foreign intervention. This is part of Phetsarat’s strategy of unifying the Kingdom of Luang Prabang with the territories of central and southern Laos, which had been administered as colonies rather than protectorates under the authority of the French résident supérieur . This action creates a rift between traditional conservatives and progressive nationalists, who differ in their schedule and framework for the realization of Lao independence. 29 August. A fleet of eight C-47 aircraft flying out of Bangkok’s Don Muang Airport transports 150 American prisoners of war home after toiling along the Thailand– Burma Railroad. Arranged by the American Office of Strategic Services, this is the first large-scale repatriation of POWs from the country. A similar British operation follows soon after. 30 August. Two days after an advance party of U.S. Army airborne forces secures Atsugi aerodrome near Tokyo, General MacArthur arrives by plane. Meanwhile U.S. marines come ashore in Tokyo Bay in full combat gear and clearly prepared for Japanese treachery. The next day MacArthur assumes command of the Japanese government in Tokyo. This is the first time in its history that Japan is occupied by a foreign power. 19 August. U.S. Secretary of State James Byrnes declares in a statement issued in Washington that the U.S. views Thailand ‘not as an enemy but as a country to be liberated from the enemy’. This is in response to Thai Regent Pridi Phanomyong’s August 16 statement declaring Thailand’s declaration of war as unconstitutional. 20 August. Although some Chinese forces are already in northern Laos, it will be several weeks before China’s occupation army actually enters Indochina. The Japanese are supposed to maintain order in Laos until they can formally surrender to incoming Allied forces. The reality is a fragmentation of authority. Meanwhile, Free French forces previously in exile in southern China and northern Burma are already active in the north-west. Some Japanese units hand over arms and other equipment to militia groups dominated by ethnic Vietnamese living in urban centres along the Mekong. Determined to prevent a French return, Lao Issara and Lao-pen-Lao nationalist groups also move to fill the power vacuum. They take control of Savannakhet and Thakhek with the assistance of Viet Kieu Salvation Association forces from both sides of the Mekong. Popular anti-French protests are aired in other areas while British and American personnel in northeastern Thailand are lobbied in support of the Lao nationalist cause. 27 August. France announces its refusal to submit the Indochina border question to the United Nations and demands the unconditional return of territories ceded to Thailand in May 1941.